I’ve had a longstanding infatuation with pizza. It was born at the local Chuck E. Cheese, I think, at some kid’s birthday party where I spent more time marveling at the giant slices than watching those creepy mechanical animals sing and dance. And then there was one of my own birthday parties where we made homemade pizzas, which unsurprisingly resulted in saucy faces and an unfortunate mozzarella-in-the-hair episode. Oh, and I couldn’t possibly forget the Apollo, a “pizza parlor” (bar) in northern Minnesota near my grandparents’ house. We’d arrive early (to avoid the debauchery of the later hours, I now realize) and feed quarter after quarter into the pinball machine (right next to the pull tabs) and jukebox (flanked by neon beer signs that emitted a faint buzzzz). The menu featured a predictable array of jalapeno poppers and deep-fried, well, anything. 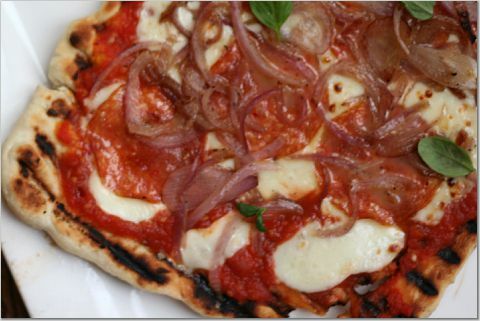 But, man, was (is) the pizza good, with a cracker-thin crust, a zesty old-school sauce and a modest smatter of mozzarella. 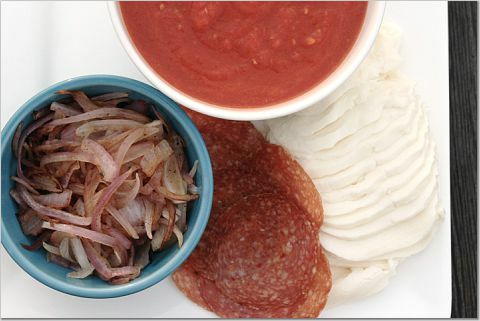 It was usually bedecked with bits of Italian sausage that were nearly meatball-sized and sliced into little squares. You don’t even want to know the number of those little squares I could pack away as a small child. In high school, I fell for a pizzeria in Minneapolis, where the waiters slid the piping hot pizza trays onto old tomato cans, papered with cheery, vintage-y images. In college, I was introduced to deep-dish and the joys of the nearly-free pitchers of beer at Giordano’s on Monday nights. I also had a little frozen pizza habit, usually indulged in the wee hours, but I think that’s best left in the past, no? And then there was my trip to Europe with Kevin, the Italian leg of which involved at least one pizza (and a scoop of gelato, ahem) a day. After college, Kevin and I made it our personal mission—one we took quite seriously—to sample the best pizzas in D.C., one of the only culinary missions we could afford in a town known for expensive restaurants (especially for us: fresh out of college, one subsisting on a wee non-profit salary and the other in grad school). 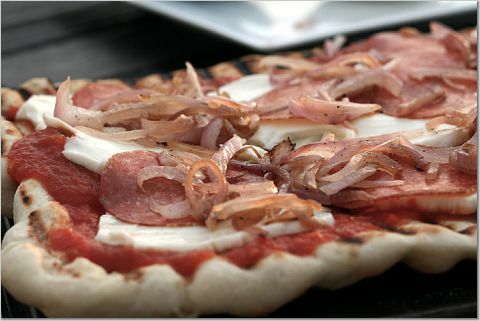 We fell in love with super-thin pizzas, baked to a crackly semi-char in brick-oven and wood-fired pizzas. We’ve since found the same in Chicago and in various cities we’ve visited. Soon, I wanted to try my hand at home. Armed with an oven that only reached 500 degrees, a pizza stone and low expectations, I began to experiment. After trying a bunch of crust recipes (I like this one, both because of the ease of making and stretching it and its taste), tweaking my sauce recipe (which inevitably ends with a declaration that this is the one, only to be followed by more tweaks and another triumphant proclamation) and more pizza nights than I’m prepared to count, I deemed our version of pizza an acceptable at-home substitute. But, mentally, I put it in a category separate from our favorite pizzas out, assuming my home-baked crust could never achieve the same crispy exterior/pillowy interior, not to mention the blistered bottom. But then! Then, I saw Mario Batali, who’s promoting his new grill-focused cookbook, grill a pizza. I’m not sure why I hadn’t considered the grill before, because it took us one step closer to our pizza ideal, right here at home. The crust par-grilled in about five minutes, hardly enough time to pour a couple glasses of wine, let alone snap photos. But it was enough time for the grill to leave its ridged imprint on the dough, creating little crevices for pools of sauce (which, this time, was just right!) and the char-tasted we’d been seeking. Once topped, the pizza took a final spin in the hot grill, emerging as an irresistible, bubbling pie. I can’t wait to see where this new phase of my pizza life takes us this summer. Prepare a grill. Brush the top of the dough rectangle with olive oil. 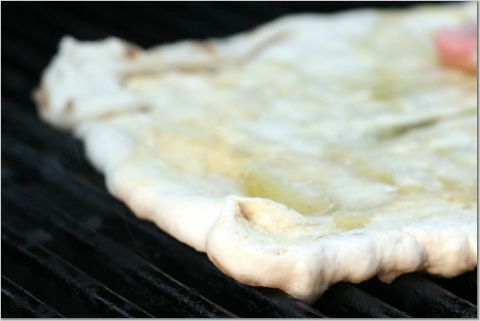 When the grill is heated, transfer the dough to the grill, placing it directly on the rack, oiled side down. Quickly brush the top with olive oil and close the grill. Grill for 2 to 3 minutes. 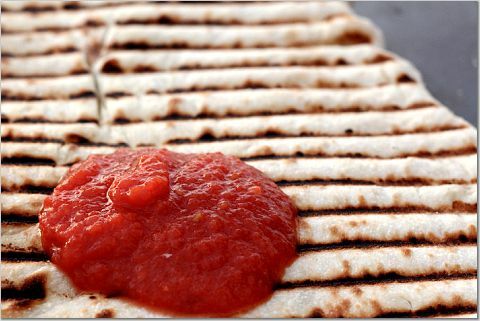 Using tongs or a spatula, turn the dough over and grill an additional 2 to 3 minutes. 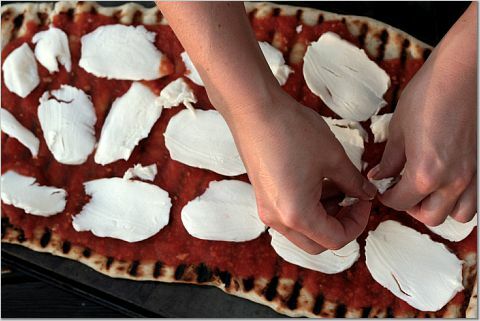 Remove the grill to a pizza peel or the back of baking sheet. Sprinkle lightly with sea salt and top with basil leaves to serve. Update: I got a couple requests for the tomato sauce recipe, so I’m updating this post with the recipe. The sauce is rich and sweet and, best of all, it highlights the simple, beautiful flavor of tomatoes. I don’t cook much with butter (I usually use olive oil), but it makes all the difference here. Note: This will yield more sauce than you’ll need for the pizza recipe above. Leftovers make an excellent simple pasta sauce and also freeze well. In a large skillet, melt the butter over medium heat. Add the onion and garlic and cook for several minutes, until the onions have softened. Add the tomatoes, salt, pepper, wine and sugar. Simmer for 20 to 30 minutes. Using an immersion blender, food processor or blender, puree the sauce until smooth. I share the same infactuation for grilled pizza. It is so fun to cook and so many great ingredients to top it with. Looks wonderful, and great pics. Looks delicious! More importantly: What did you and Kevin deem to be the best pizza in DC? Alex: Thank you! My favorite was 2 Amys. I miss a lot of restaurants in DC, and that one’s at the top of the list. Kevin would probably say Matchbox. Are you in DC? If so, what’s your favorite? Amy: Thanks! And lucky you–a new grill! It’s like an addition to the family (not to mention an extension of the kitchen). And, of course I’ll share my tomato sauce (in its most recent incarnation). I’ll update this post with it later today. 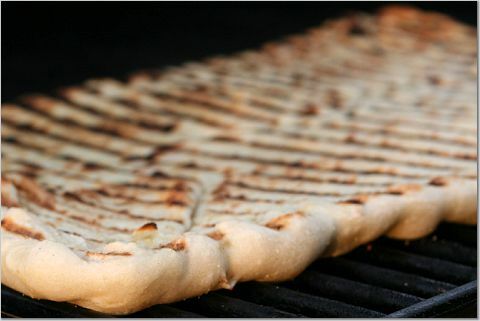 I have never grilled pizza, but I love the taste when I have had it in restaurants! 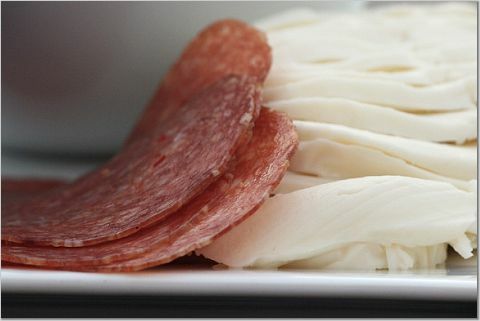 I bet prosciutto would be good on this as an alternative to salami! You are filling my summer with new plans! This looks amazing… and so fun! Your Pizza looks scrumptious. As a native Chicagoian, I do love my deep dishes, but I really recommend you Caponie’s brick oven pizza. I usually get spinach and garlic and its great! A little bit of a hike, but totally worth it. I have been wanting to try grilled pizza forever. I think this will have to be the summer to go for it! I am in DC (at least for now)! I would agree that 2 Amys is pretty darn tasty. There is a place that has opened near me called Comet Pizza that I like a lot, but I am sure there is better pizza out there! Emily: So happy to give that new grill a workout! Maddie: There aren’t many things that would take me in that direction (geographically), but I’m intrigued. I think I’ll have to try it! Thanks for the tip. RecipeGirl: Yes, do it! Let me know how it goes. Alex: Comet sounds very interesting. Carole Greenwood does pizza, huh? Yep, Carole Greenwood does pizza. And since Carole has anything to do with it, Tom Sietsma (food critic for the Post) is all over it. Alex: Oh, I know Tom! I used to love his online chats. You’re making me miss DC in a big, big way. That looks delicious. 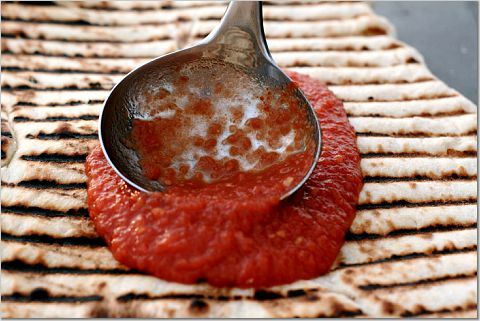 What pizza sauce recipe did you use? Michelle (and Amy): I’ve updated the post with the tomato sauce recipe and some notes about it. Enjoy! I’ve been looking all over this post for your pizza dough recipe? Care to share…? It looks amazing! Hi Samantha: I just fixed the link. Sorry about that!